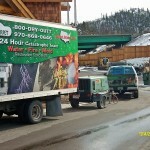 "Best Quality at a Kinder Price • Water • Fire • Mold"
A Kinder Carpet / United Drying, located in Silverthorne, Colorado, has been serving business and homeowners in the Summit County area since 1992. A Kinder Carpet provides local 24 hour emergency services for water, fire and mold restoration projects, as well as carpet, upholstery and hard surface cleaning for all commercial and residential properties. 24 Hour Emergency Services are available 7 days a week. Owners, Tom & Kevin are on site for all of our restoration jobs. For more than 20 years A Kinder Carpet has been helping people in, and around, Summit County. A Kinder Carpet has won the “Best of Summit Award” for the past 10 years! Available 24/7 for Water Damage Emergencies! Schedule your carpet cleaning today online. Did you know that your insurance company can NOT tell you who to use for your claim? In Colorado it is state law (10-4-120 – Unfair or Discriminatory trade practices) that it is up to the homeowner / policy holder to decide who does the damage restoration, it is not the insurance company’s decision! Copyright 2012 A Kinder Carpet, Inc. - Serving Summit, Eagle, Lake, Grand & Park County Colorado.